The UT Arlington Office of Sustainability has received the Environmental Protection Agency’s Food Recovery Challenge Award for Leadership. Participants are asked to reduce food waste by 5 percent over five years through prevention, donation, or composting. 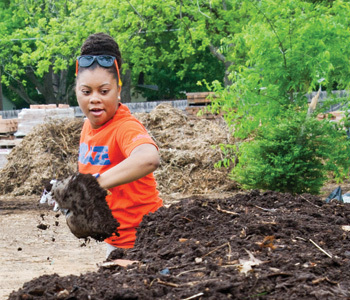 Composting is the UTA program’s main focus. Since 2005 volunteers and staff have steadily increased the amount of food waste collected and composted from campus dining services and off-campus coffee shops and hospitals, as well as yard waste from University grounds crews. UT Arlington composts about 68,000 pounds of waste each year.